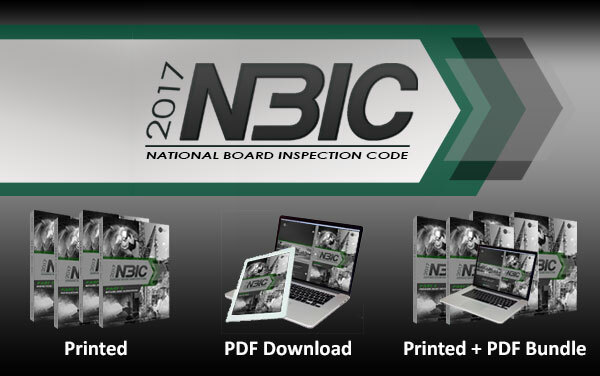 The National Board Inspection Code (NBIC) is issued every two years and this year is organized into four (4) parts. It is developed to maintain the integrity of pressure-retaining items by providing rules for installation (Part 1), and after the items have been placed into service, by providing rules for inspection (Part 2) and repair and alteration (Part 3), thereby ensuring these items may continue to be used safely. A new Part 4 has been added to integrate the requirements for pressure relief devices. IMPORTANT: You will need to log on to our website for ordering. When ordering a PDF download, the file will be watermarked with the name of the person logged on at the time of purchase. Your login can also be used to retrieve your NBIC PDF download if needed in the future. Click here if you do not have an existing account. PLEASE NOTE: an online training account cannot be used for online ordering. Part 1, Installation — This Part provides information and guidance to ensure all types of pressure-retaining items are installed and function properly. Installation includes meeting specific safety criteria for construction, materials, design, supports, safety devices, operation, testing, and maintenance. Part 2, Inspection — This Part provides information and guidance needed to perform and document inspections for all types of pressure-retaining items. It includes information on personnel safety, non-destructive examination, tests, failure mechanisms, types of pressure equipment, fitness for service, risk-based assessments, and performance-based standards. Part 3, Repairs and Alterations — This Part provides information and guidance to perform, verify, and document acceptable repairs or alterations to pressure-retaining items regardless of code of construction. Alternative methods for examination, testing, heat treatment, etc., are provided when the original code of construction requirements cannot be met. Specific acceptable and proven repair methods are also provided. Part 4, Pressure Relief Devices NEW! — This Part provides information and guidance to perform, verify, and document the installation, inspection, and repair of Pressure Relief Devices, including a supplemental section that contains specialized information, such as pressure margins, recommended repair practices, and test stand design details.